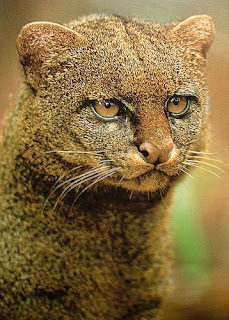 The Jaguarundi is a small, slender-bodied, unspotted cat, slightly larger than a domestic cat (7-22 pounds). Jaguarundis are characterized by slender, elongated bodies, small flattened heads, and long tails (11-24 inches) more reminiscent of an otter or weasel than a cat. Other characteristics include short legs standing at a height of 11 inches at the shoulder; and short, rounded, widely spacedears. There are three color phases: black, reddish-brown and a brownish-gray. Because of similarity in size, the Jaguarundi can easily be confused with a large black feral cat, especially when seen in low light or dense cover. Little is known about the habitat of Jaguarundis in Texas. It is thought that they occur in the dense thorny shrublands of the Rio Grande Valley. Their habitat may be very similar to that of the Ocelot, although sightings and information from Mexico indicate that the Jaguarundi may be more tolerant of open areas, such as grass lands and pastures, than the Ocelot. Typical habitat consists of mixed thornshrub species such as spiny hackberry, brasil, desert yaupon, wolfberry, lotebush, amargosa, white-brush, catclaw, blackbrush, lantana, guayacan, cenizo, elbowbush, and Texas persimmon. Interspersed trees such as mesquite, live oak, ebony, and hackberry may also occur. Riparian habitats along rivers or creeks are sometimes used by Jaguarundis. Canopy cover and density of shrubs are important considerations in identif ying suitable habitat. Little information exists concerning optimal habitat for the Jaguarundi in Texas. Scientists speculate that these elusive cats are similar to the Ocelot in their requirement for dense brush cover. Tracts of at least 100 acres of isolated dense brush, or 75 acres of brush interconnected with other habitat tracts by brush corridors, are considered important habitat. 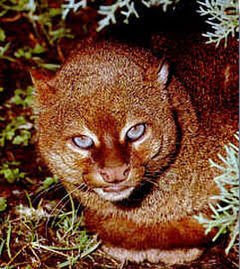 Even brush tracts as small as 5 acres, when adjacent to larger areas of habitat, may be used by Jaguarundis. Roads, narrow water bodies, and rights-of-way are not considered barriers to movements. Brushy fence lines, water courses, and other brush strips connecting areas of habitat are very important in providing escape and protective cover. These strip corridors are considered important habitat. Texas counties where Jaguarundis occurred during the past 30 years include Cameron and Willacy. Little information is available concerning the biology of the Jaguarundi in Texas. Most of what is known comes from anecdotal or historical writings and information gained through the study of Ocelots in south Texas. Jaguarundis hunt primarily during the day with peak activity occurring at midday. They are lessnocturnal than the Ocelot and havebeen observed more often during the day. 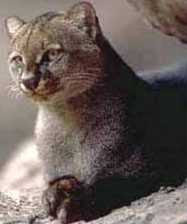 Jaguarundis forage mainly on the ground. Prey includes birds, rabbits, reptiles, and small rodents. Historical accounts from Mexico suggest that Jaguarundis are good swimmers and enter the water freely. Little is known regarding Jaguarundi reproduction in Texas. In Mexico, Jaguarundis are said to be solitary, except during the mating season of November and December. Kittens have been reported in March and also in August. It is not known whether females produce one or two litters each season. The gestation period is 60 to 75 days, and litters contain two to four young. Historically, dense mixed brush occurred along dry washes, arroyos, resacas, and the flood plains of the Rio Grande. The extensive shrub lands of the Lower Rio Grande Valley have been converted to agriculture and urban development over the past 60 years. Much of this land, particu larly the more fertile soils, has been cleared for production of vegetables, citrus, sugarcane, cotton, and other crops. Unfortunately for the Jaguarundi and Ocelot (another endangered South Texas cat), the best soil types also grow the thickest brush and thus produce the best habitat. Less than 5% of the original vegetation remains in the Rio Grande Valley. 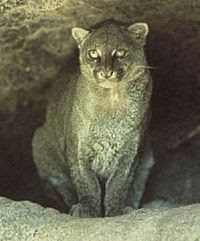 The Jaguarundi is one of the rarest cats in Texas, with only the Jaguar, which has not been reported in recent years, being rarer. Information about this species is urgently needed. Unless vigorous conservation measures are taken soon, this elusive cat may join the list of species extirpated from the United States. Very little is known concerning Jaguarundi biology in south Texas. Research regarding capture techniques, reproduction, rearing of young, dispersal, home range, and movements is urgently needed. Recently initiated Jaguarundi research in northeast Mexico, where they are more common, will enable biologists to better understand the requirements for a viable population. This information can then be used to assist conservation efforts for the Jaguarundi in Texas. Efforts to inform landowners and the public about the habitat needs, land management options, and biology of the Jaguarundi are also critical to recovery. 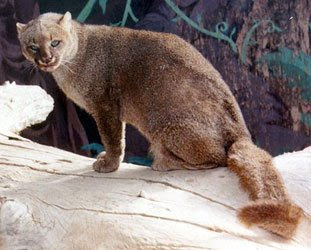 Conservation of remaining habitat, and maintenance or creation of brush corridors connecting these habitats, is necessary for survival of the Jaguarundi population in Texas. The U.S. Fish and Wildlife Service, Texas Parks and Wildlife Department, The Nature Conservancy, and many local landowners have been working to protect, acquire and restore Jaguarundi habitat in the Rio Grande Valley. Restoration generally involves revegetating previously cleared areas with native trees and shrubs. The best places to visit to learn more about the Jaguarundi are the Laguna Atascosa National Wildlife Refuge near Rio Hondo (956) 748-3607, Santa Ana National Wildlife Refuge near A lamo (956) 787-3079, Bentsen-Rio Grande Valley State Park near Mission (956) 585-1107, Las Palomas Wildlife Management Area near Edinburg (956) 447-2704, and Audubon’s Sabal Palm Grove Sanctuary near Brownsville (956) 541-8034.
sure to note size, color, habitat, behavior, location, date, and time of day seen. Management guidelines are available from the Texas Parks and Wildlife Department or U.S. 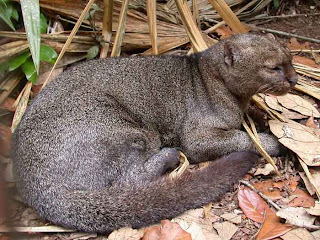 Fish and Wildlife Service for landowners and managers wishing to conserve and improve habitat for the Jaguarundi. Tewes, M.E. and D.J. Schmidly. 1987. “The neotropical felids: jaguar, ocelot, margay, and jaguarundi” in M. Novak, J. Baker, M.E. Obbard and B. Malloch (eds.) Wild Furbearer Management and Conservation in North America. Ministry of Natural Resources, Ontario. 703-705. U.S. Fish and Wildlife Service. 1990. Listed cats of Texas and Arizona recovery plan (with emphasis on the ocelot) . Endangered Species Office, Albuquerque, N.M. yupp..I'm right about you..you're the angel for everything, include for the wildlife. You have many great talents which will make you to become a great person soon. mmhhh,. do you really an expert on this.., i'm really wanna know? i'm so excited.. great post put... have a nice day.. Very interesting. I saw what I thought was a baby panther cross right in front of my car. I live in Fort Worth, TX near the Trinity river. After researching wildcats in Texas I have no doubt that what I saw was a Jaguarundi. i live on a ranch in south texas and have twice seen a Jaguarundi at the same spot near my house at dusk. the second sighting was tonight. i got a good look at it this evening and can confirm that indeed it is this species. CAN U PLEASE TELL ME WHAT THE SURVIVAL TECHNIQUES ARE?